"Hello, I just held my first murder mystery party, with Death on the Rocks, over this past weekend and it was a great success. I was so nervous that people might not really be into it, but thankfully I was wrong. At first a lot of people were overwhelmed with how much info they had to go through upon arrival, but once the game actually started and everyone started to talking to other people, it seemed to click and they got REALLY into it. Everyone seemed to have a blast. There were lots of lying, backstabbing, and people not trusting others even when their character sheet said they should. It was hilarious. My favorite thing from the evening was that the character of [censored] convinced [censored] she didn't [censored], so even he was shocked at the end of the night when it was revealed she did. Only 1 person guessed the murderer. The characters who received the most votes was split between [censored] and surprisingly [censored], the person playing them was acting very shady all night. Overall the game was a fantastic success and we're already planning to host one again next year!" 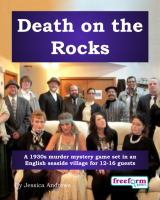 Death on the Rocks is a dinner party murder mystery game for 12 to 16 guests and a host – download the free introductory pdf file. Join us in a thrilling evening of romantic scandal, poisonous gossip, political tension and murder You will be in the middle of the action and it will be up to you to wheel and deal with the other guests. Can you achieve your goals, keep your secrets hidden and survive Death on the Rocks? It's up to you. Death on the Rocks is set in 1936, on the notoriously cold and windy Gull Island, just off the north-east coast of England, whose perilous rocks have claimed many a victim. It is 6:30pm on the eve of the winter's Solstice, a traditional day of celebration for the villagers of Little Bleakly – much to the horror of the local Reverend. The wind is howling and the rain is coming down in sheets, but inside the village hall has been cheerfully decorated with brightly coloured flags and bunting. The needle of the gramophone is poised over 'Music Maestro Please', and many of the villagers have already arrived in the village hall, when Little Bleakly is suddenly plunged into darkness by a power cut. Stumbling along the shadowy and winding paths with candles in their hands, the remaining villagers are on their way when light returns. Get ready for suspicion, intrigue, gossip and a jolly good pub meal – and join us at Death on the Rocks! Death on the Rocks lasts for about four hours and is suited to an evening. It is often played over a meal – a finger buffet if possible to allow guests to circulate and talk in private. The free introductory pdf file contains an introduction to the game, a cast list of all the characters, and a copy of the Gull Island Gazette – plus details of how to buy the game. Death on the Rocks is unlike many murder mystery games. Although the game starts with a murder, most of the characters have more important things to do than to investigate it. And the killing may not be over – it is unlikely that everyone will survive the remainder of the evening! Death on the Rocks is played just like a murder mystery game. You may be trying to solve the murder, but primarily you are (initially at least) concentrating on your own goals and objectives. Unlike most boxed murder mystery games, Death on the Rocks lets you decide how to achieve your goals and thwart your enemies. On the evening of the game the guests are met by the organizer, the Malady family's Lawyer, and welcomed to Little Bleakly. They then receive their detailed backgrounds – including dark secrets, objectives and money. The fun then begins as they form alliances, blackmail each other, steal items and maybe even try to murder one another! Along the way they may uncover some of the mysteries of Death on the Rocks. What is the secret of the wig? Is there really a gypsy curse? What is kept in small blue glass bottles? Who wants to live forever? Who might be a foreign spy? And, of course, who killed Hugo Malady? Depending on what the players choose to do, there are several different possible endings, but finally everyone finds out how they did, and what secrets everyone else was concealing. Death on the Rocks costs £20.00 (GB pounds) or US $29.99. You can buy it in either currency, from anywhere in the world, as you prefer. The price will be converted back into your own currency for you, at today's exchange rate. We offer a Cast Iron Guarantee on all our murder mystery games. If you're not completely satisfied with Death on the Rocks then please let us know within 30 days and we will refund you. See our full terms and conditions here.